In the late 1940s and 1950s, aerodynamic principles were just beginning to take root in automotive design. Curvilinear forms became more prominent, carrying the immediate promise of power and speed – but designers were guided more by their aesthetic sense than by any scientific precepts. Inspired by the dynamic profiles of automotive and aviation mid-century design, HM9 Flow treads the path first opened by the HM4 Thunderbolt and HM6 Space Pirate, utilising a geometrically complex combination of milled sapphire crystal and titanium case elements. But HM9 goes beyond its predecessors, redefining what was thought to be possible in case design. Reminiscent of a jet engine, the highly complex case encloses an equally complex manual winding movement, developed fully in house. 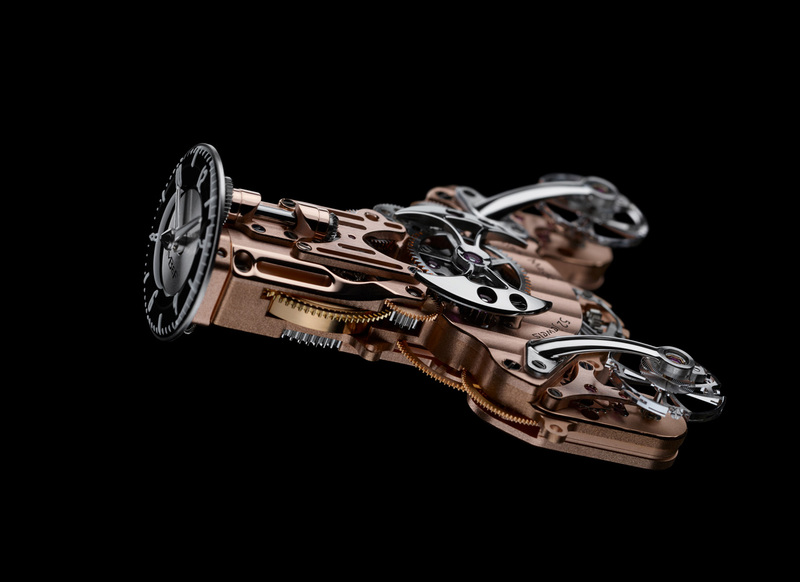 Twin balance wheels beat independently on each flank of the Machine, while the central body reveals the gearbox of the HM9 engine: a planetary differential that averages the output of both balances to provide one stable reading of the time. * Material: two launch editions in grade-5 titanium. 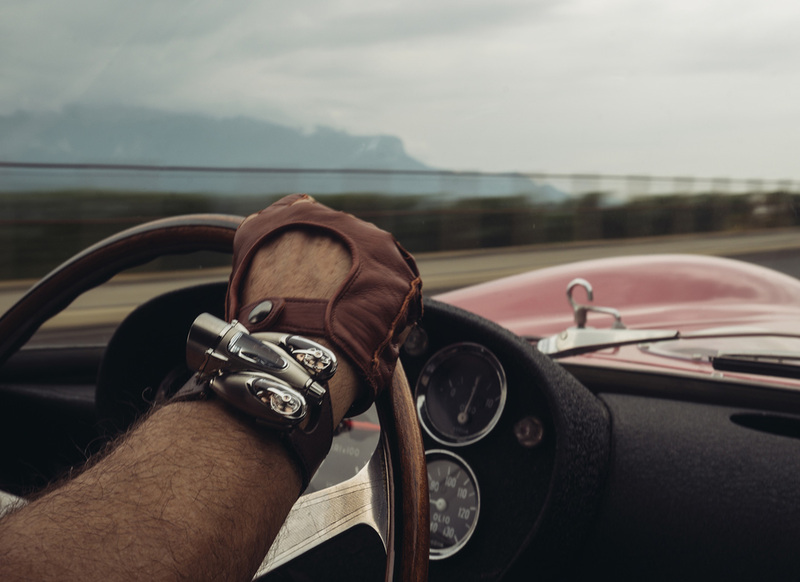 * Editions: Road edition with rose gold plated movement and speedometer-type dial; Air edition with darkened NAC movement and aviation-style dial. Reminiscent of a jet engine, the HM9 case is a geometrically complex combination of milled sapphire crystal and grade 5 titanium. 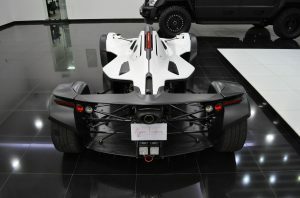 The extreme curves and acute angles required new manufacturing standards and techniques. 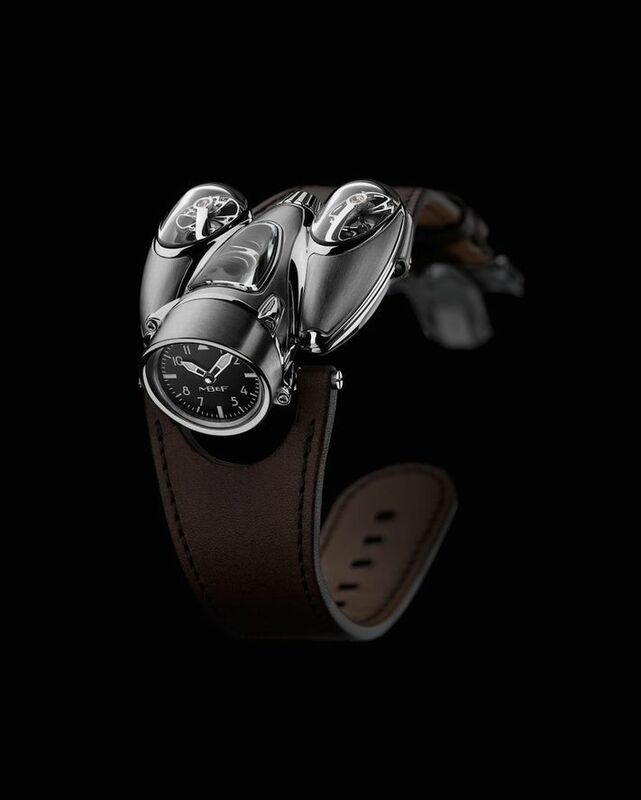 The wide-to-narrow alternating arrangement of the three primary volumes of the HM9 case required dividing the case along two axes and devising an unprecedented 3-D gasket for water resistance; a patented innovation, completely novel in its execution throughout the watchmaking industry.